At work place we have been reviewing few bolt-on applicationsfor PeoplSoft ERP that can be used for employee on-boarding. All those tools were great and they had one thing in common, i.e. they all were developed in Adobe Flex. In recent years the usage of Flex has increased tremendously and there are good reasons for that. We will go through them. 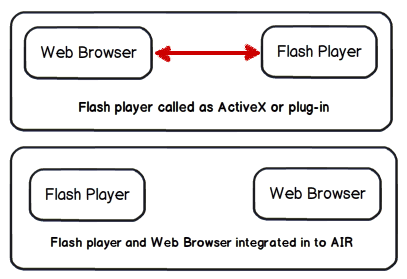 Flex is a platform for developing and deploying RIA ‘s that run on Flash player on Web and Adobe AIR on desktop. In this platform you develop applications mainly using two languages, MXML and Action Script. 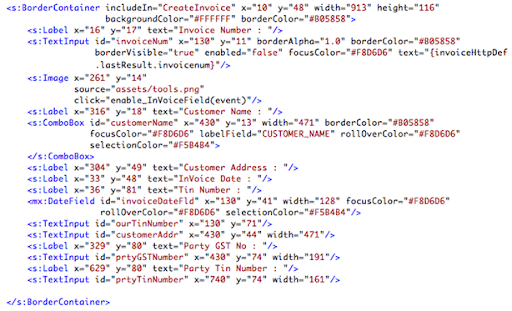 MXML is pure XML based markup language that is used to define flex application components (for eg: field, menus.. data grids.. you will see how easy it is to develop a page with multiple components shortly). Flex applications are compiled to SWF files and are executed at runtime by Adobe Flash Player or by Adobe AIR(Includes flash player). The figures below explain the architecture of these. The best part of it is that its platform independent. We install the Adobe Flash player/AIR for the specific platform and our application will work great. 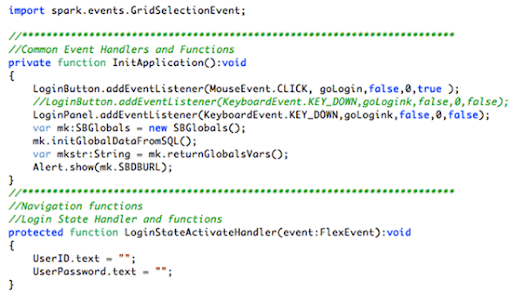 The recent Flex4.5 has great support for mobile applications development too. You can develop mobile apps that can work on multiple platforms that include Apple iOS, Google Android, and BlackBerry Tablet OS. This can be great for app developers as it reduces time and effort in developing the same app in different proprietary frameworks. To start writing a hello world application in Flex all we need is a development tool and we have three options. Flash Builder, Flex SDK or Flash Catalyst. My favorite tool is Flash builder and you can download a trail version to try it out from here. Full Screen There are tremendous resources available to learn Flex development. To start with you can watch this video tutorial called Flex in a Week.This is great and it will give you a start. To know what can be achieved in Flex, take a look at this TourDeFlex application that is deployed in both Web and AIR formats. Here is a sample application gallery link. Finally, why enterprise applications are using Flex? Because of its integration capability. The framework includes three RPC (Remote Procedure Call) components and they are HTTPService Component: This component makes HTTP request with any web server and can handle responses in XML, Plain text and JSON formats. RemoteObject Component: This component communicates with application servers using AMF protocol includes ColdFusion, Live Cycle Data services, BlazeDS, Zend AMF(php) and etc. WebService Component: This component works with industry standard SOAP messaging format. On top of this, Adobe has made the development very simple with auto code generation functionality that they built in to the Falsh developer (an Eclipse based IDE). You will see that in the Flex in a Week training classes. Take a look the video classes and if you are interested we will start project using which we can explore Flex framework. Native Extension are an important feature for Flex allows anyone to extend the functionality on our own rather than waiting for Adobe to build it, enterprise applications will benefits great from this. on our own rather than waiting for Adobe to build it, enterprise applications will benefits great from this. This is a very comprehensive article that shed the light on this very important subject in the digital era. Thank you for a great read. Please let me know whether its possible to develop complex flex application without flash builder. I tried downloading flash builder but failed due to communication/network problem. Please suggest me some alternate to flash builder.